The device is Bastak branded and its model is 3100. 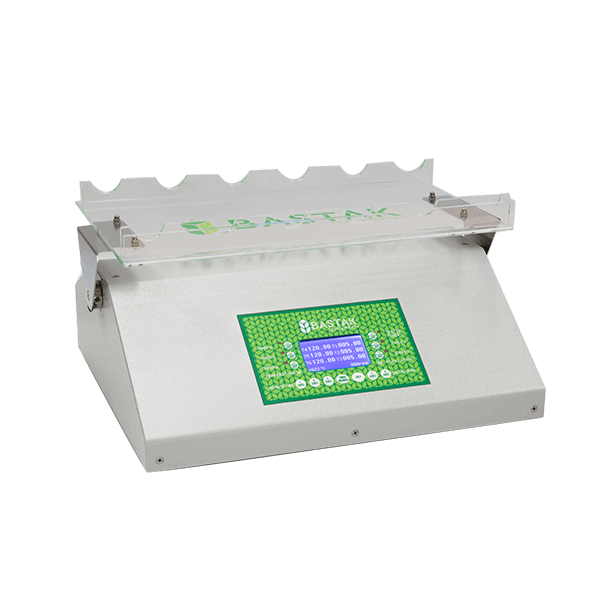 It is used in determining the bread quality and sunn pest destruction of the samples of wheat and flour. It constitutes desired wheat mixture sedimentation and delayed sedimentation values at the factory. The device has graphic LCD screen. There are 5-digit (3 digits for minutes, 2 digits for seconds) 6 separate timers in total on the screen. The remaining testing period can be seen on the screen during the operation. The ambient temperature during testing can be monitored from the screen of the device. The device automatically adjusts to 40 revolution/minute that is the world standard whatever the mains voltage is and displays the operating revolution on its screen. The outside dimensions of the device are 460x220x350 mm and its net weight is 8 kg. Scope: Applicable to wheat flour. Principle: Swelling of the gluten fraction of flour in lactic acid solution affects the rate of sedimentation of a flour suspension in the lactic acid medium. Higher gluten content and better gluten quality both give rise to slower sedimentation and higher Sedimentation Test values.